frame skips and frame duplication for a perfect conversion of every frame. Audio signals are locked to video signals to maintain audio to video synchronization. for each extra hour or any part thereof. $16 per cassette with under 10 minutes of original content. Videotape or cassette repair is $15, which includes disassembly, if necessary. The repair charge is in addition to the digital conversion charge. Give me a call if you are not sure of the cassette format! $20 for any cassette with under 10 minutes of original content. Videotape or cassette repair is $20, which includes disassembly, if necessary. ​A DVD can hold up to 4.7GB, about 2 hours of standard definition MPEG-2 video. Our USB3 drives are 32GB, equal to about 7 DVDs. and large enough to hold all your digitized video files. or up to 3 hours of high definition video (H.264 MPEG-4). Don't worry about title names, even if you don't know the content of your videocassettes! You don’t have to spend any time viewing your videocassettes to come up with titles for each, which is a time consuming and tedious task! You can create titles for your videocassettes AFTER we convert them to digital files! 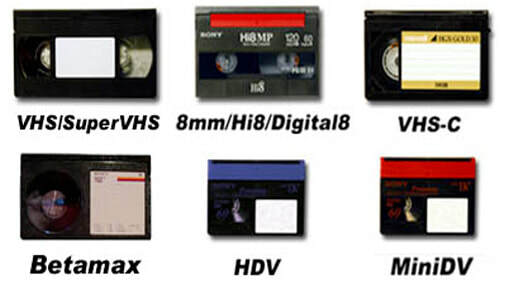 After we convert your videocassettes, we'll upload thumbnails of your files to Google Drive and email you a link. Just click on the link and view your files and assign title names. Each file has a number, so just email us a list of each number with its corresponding desired title. That’s it! There is no charge for this service.